1. What Is The Best Nail Strengthener? 4. How to strengthen nails? 5. How to get rid of nail ridges? 6. How to fix peeling nails? 7. How to fix brittle nails? 8. How to moisturize nails? 10.1. Why are my nails soft and bendy? 10.2. What vitamins are good for nail growth? 10.3. Does nail polish help your nails grow? 11. Time for A Short Quiz! Having weak nails can certainly be frustrating, especially when your nails easily get chipped off under average circumstances like when you’re washing the dishes or washing your hair. If you’re the kind of person who likes making their nails look pretty with nail polish, weak nails can instantly ruin your freshly polished nails. Fortunately, there is a way to get stronger nails without spending much cash. All you really need is to get the best nail strengthener in your hands and you’ll have strong nails in no time. Have no idea which nail strengthener you should get? Don’t fret, cause we already took the time to do some research and testing to find the best nail strengthener for you. Just take a look at our short buying guide below to learn about nail strengtheners, their pros and cons, and other things that can help you decide which nail strengthener you should get. What Is The Best Nail Strengthener? For this best nail strengthener buying guide, we will be covering five different products that were highly commended by nail strengthener users. However, since only one product can be the best, we had to do some extra research and testing to find which one of these five nail strengtheners are the best. Here is a short table that we have prepared to give you a glimpse of the products we included in this roundup. In this table, you will the the products’ brand, features, type, and amount. From here alone you may be able to determine which product you like the most. Already have a product in mind? Don’t go buying stuff just yet. You may want to learn a bit more about the products we have included in this roundup. In this part of the article, you will learn a little more about the products you found in the table above. Below you will learn about every product’s pros and cons, what makes them great enough to be the best nail strengthener, as well as how you could use them. Try to read our short reviews for each product to gain more knowledge about them. After all, the best way to get good value for your money is by ,making sure that the products you are buying perfectly meets your personal preferences and requirements. Take a look at our short reviews below to find out which product suits you most. 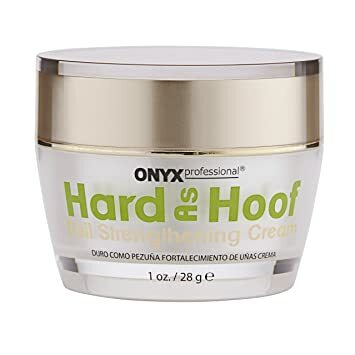 If you have weak nails and dry hands, you may find this Hard As Hoof Nail Strengthening Cream from Onyx Professional a great buy since it’s basically a nail strengthener and hand moisturizer combined. What we liked most about this product is it’s 2-in-1 purpose that makes it great for treating weak nails and dry hands. It comes in a cream infused with coconut fragrance that will make your hands and nails hydrated and smelling fresh all day. This product’s formula was specifically developed for very weak nails. After a couple days of use, this product can help your nails grow strong enough to reduce the occurrence of nail chipping, peeling, splitting, and cracking. We also loved how this product is rich in minerals and vitamins for nails as well as emollients that can ultimately help dry brittle nails. What’s more is that it comes at a very affordable price with in an amount that’s more than what you could get from its competitors. Try to watch this short clip to see a 30-day trial of Onyx Professional’s Hard As Hoof nail strengthener. If you have extremely fragile and brittle nails that just seems to peel constantly, then you might want to find out more about the Nailtiques Nail Protein Formula nail strengthener. What made us include this product in our best nail strengthener buying guide is it's interesting formula that was developed for brittle nails that always peel. Even though this product comes in only .25 ounces, what it lacks in quantity it makes up for in quality. After only a week or two’s use you would be able to see and feel the difference in your nails. Upon daily application, this product with help thicken and strengthen your nails as it grows. This product is also very simple and easy to use. You just have to apply it to your nails and peel it off once it’s starting to peel off on its own before you apply a fresh new coat to your nails. Needless to say, this product will certainly give you the best bang for your buck. Watch this short review video below to learn more about this product. Just like Nailtiques Formula 1, this Nailtiques Formula 2 nail hardener and strengthener is another product that was said to be the best nail strengthener by plenty of nails strengthener users online. What people loved the most about this product is its formula that can actually treat extremely fragile nails and cuticles. 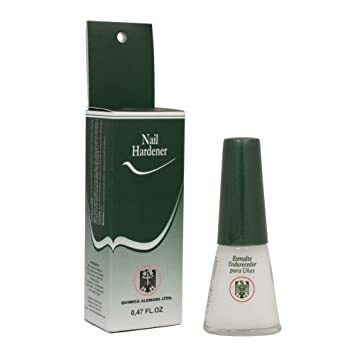 Upon application, this nail strengthener helps your nails grow stronger over time, making it ideal for thin nails. If you’re the kind of person who would love to have long nails, this nail strengthener will help you do the trick. Moreover, aside from making your nails grow stronger, it also prevents nail damage from splitting and peeling. Plenty of people wonder which Nailtiques formula is better, truth is they both work well. This one is particularly for making nails strong or for making them grow. If you want to learn more about Nailtiques’ nails strengtheners, just watch this short video review. Some people simply don’t have the time to apply nail strengthener to their nails everyday. This can be a bit of a pickle since most nail strengtheners require daily application for their effects to take place. If you want to repair broken nails and are looking for something that feels a bit low maintenance, you may enjoy using this nail strengthener from Quimica Alemana. What made us include this product in our best nail strengthener roundup is its simple and easy to use formula that’s just perfect for people who’s always busy or on the go. Just like any other nail strengthener, this one prevents splitting, chipping, and peeling of nails. It even adds an extra layer of protection to your nails and cuticles. Perhaps the main advantage of this product is that you don’t have to use it every single day. However, it does come with a couple of downsides. For one, it comes in a rather small amount. Second, it may not feel comfortable on the skin on your first try. Nonetheless, it’s still a great product that you can use to get stronger nails that won’t easily break. Watch this quick video below to find out more about the original Quimica Alemana nail strengthener. If you love doing your nails, then you may be quite familiar with the OPI brand. OPI is a popular name in the nail care industry because they produce great sets of nail polish as well as nail growth products. If you love using OPI products or if you would like to buy a product from a well known brand, you may want to check this OPI nail strengthener out. This product made it to our best nail strengthener roundup because it works as a great protective layer for nails. That’s right, you can use this product to get stronger nails and to protect your nails as they grow. On the downside, this product is known more for its protective properties than its nail growth enhancement features. This is the kind of product that’s much better for people who are looking for a quick fix. Now that you have read about our best nail strengthener reviews, you may already have made a decision on which product you should purchase. However, if you truly want the best for your nails, we recommend you read these trivia that we have prepared to help readers who don’t know much about nail care. Below you will learn about how you can treat your nails, what you should use to treat your nails, and so much more. This way, even if you’re new to nail care or not, you’ll end up knowing what to do when it comes to growing and maintaining healthier nails. Try to look at these short trivia below to learn more. Aside from using nail strengtheners, you can also try an assortment of options that have been proven to help nail growth. One thing that you should never forget is to keep your nails dry at most times. This means wearing rubber gloves when washing the dishes or wiping your hands dry after getting them wet. However, even though you will need to keep your hands away from water most of the time, you will still need to drink plenty of water on a daily basis. As you try to make your nails grow stronger, one more thing that we recommend is not growing them out at all. Having long nails will only expose you to higher risks of chipping, splitting, and peeling of the nails. Keeping them short all the time will help you grow stronger nails without having to go through much nail damage. Moreover, you should try to avoid using alcohol based hand sanitizers as those can only dry up your hands. Instead, try to use hand creams that can add moisture to your hands. Lastly, never try to use your nails as tools to pry things open and whatnot. Doing so will only put your nails at risk of damage . Before you go and start making an effort to remove your nail ridges, you must first identify what kind of fingernail ridges you have. The two kinds of fingernail ridges are horizontal and vertical. If you find horizontal nail ridges in your fingernails, you may want to seek a medical professional’s advice since horizontal nail ridges can signify certain medical conditions such as a possible heart attack, respiratory disease, or malnutrition. On the other hand, If you have vertical nail ridges, there’s no need for worry. You can easily treat vertical nail ridges in a couple of ways. One of the best ways to treat vertical nail ridges is by drinking plenty of water and by taking in vitamins with Omega 3 fatty acids. You can also try eating more walnuts or taking fish oil capsules. Another thing you can try is applying vitamin E or jojoba oils on your cuticles. Doing so will provide your nails with enough moisture to get those nail ridges out. The last option you have for removing nail ridges is by using a nail buffer. With it you can gently buff your nails to remove the ridges and to make it look extra shiny . How to fix peeling nails? The problem with nails that peel easily is that you won’t be able to enjoy lengthy nails or a great manicure. You may have even experienced nail breakage from simple bumps against hard surfaces. If you wish to repair peeling nails, you won’t have to go to the salon or spend much cash. All you have to do is trim your nails, give it a quick buff, and avoid getting your nails soaked in water. To avoid future peeling, you must refrain from pressing against your nail starting from its tip down. You should also maintain hydrated nails by using hand moisturizers and oils. You can also try using alpha hydroxy acid lotions . How to fix brittle nails? Brittle nails are a hassle to work with. You won’t be able to grow them out, keep them in shape, and so much more. It’s a good thing fixing brittle nails is simple. To make your brittle nails grow stronger, you can try soaking your nails in olive oil every once in a while for 15 minutes to fortify your nails. Other simpler things you can try is to protect your nails with a protective coating and protective gloves, especially when you usually wet your hands. Additionally, it’s also great to know which things you should avoid. Some of the things that highly affect nail health are water, alcohol, acetone, traditional nail polish remover, and using your nails as tools. Moisturizing nails may seem like a no-brainer for some since moisturizing can be as basic as applying lotions and creams. On the contrary, when it comes to nail care, moisturizing can be so much more. You can use an assortment of products including oils, lotions, moisturizers, cuticle spa treatments, and even plain petroleum jelly. You can simply apply these products to your nails every now and then to keep them moist. Doing so is what prevents chipping, peeling, and other kinds of nail damage caused by lack of moisture. Other kinds of treatments you may try is soaking your nails in oils like olive oil, bath oil, and vitamin oils. Try to gather these following materials and follow these simple instructions to properly moisturize your nails. Before you soak your nails, the first thing you should do is wash them first to get rid of dirt, dust, germs, or any other contaminants that may have gotten under and over your nails. Just wash your nails with water and soap and dry it with a towel afterwards. Using a small bowl, collect about half a cup of olive oil. Make sure that the bowl you are using is completely clean and can fit all five or ten of your fingers at once. Simply soak your nails in the bowl for up to 15 minutes. When doing so, ensure that every nail is completely soaked from end to end. Once 15 minutes have passed, the next thing you should do is wash of the oil from your nails and hands. Try to wash it off with alcohol free soap and rinse it with water. Don’t forget to wipe your nails dry with a clean towel after washing off the oil. To seal in your nails, the last thing you should do is apply some moisturizer to all of your nails. Make sure to gently spread the moisturizer over and under your nails. You can try this nail moisturizing procedure every day or every other day for 15 minutes for every nail. If you want, you can also try using the same olive oil for your next nail moisturizing session if its still clean. Try to watch this video to see how you can moisturize your nails. Having damaged nails can either be literally painful or just downright ugly. If you want to repair damaged nails, the key is applying a consistent nail care regimen. But before anything else, you should determine how badly damaged your nails are. If your nails have been damaged to the point where there’s a lot of blood or flesh under your nails were exposed, the first thing you should do is cover it up with a clean piece of clothing and go to a medical professional immediately. Otherwise, you may observe your nails further to determine your next step in action. If your nails have undergone minor damage, you may get off safely with a gentle cleanse and airing it out. Other signs of unhealthy nails are discolorations, ridges, and bumps. Though these signs may not look so serious, you should go for a check up with a doctor to find out if these signs could be signaling underlying medical conditions. Yellowish and greenish nails for one, signify fungal infections that must be treated by a medical professional. Another sign is small white patches that may signify mineral or vitamin deficiency. Seeking a medical professional’s opinion on your nails is a very important feat that you should never underestimate. Plenty of serious illnesses such as kidney disease can cause an effect on your nails. If your nails are free of discolorations or other unusual marks, the next step you should take to repair your damaged nails is to avoid using nail polish. Sure, nail polish can help protect your nails, however, if you have weak nails, the nail polish will only weaken it more. Try to go 2 up to 3 weeks without using nail polish to let your nails take a breather. Once your nails are completely bare, another thing you can do to help your nails heal better is to keep them trimmed. Keeping your fingernails trimmed will keep them from chipping or breaking. When trimming your nails, we suggest you follow up with a gentle go of a nail file as well. Next to maintaining trimmed nails is buffing and moisturizing. You can gently buff your nails with the softer side of a nail file to get a nice shine and to increase blood blow. After buffing, all that there’s left to do is add the moisturizer and repeat every other day or so. TIP: When using nail moisturizers, try to apply them everytime after you wash your hands. To seal in the moisture, you may try applying moisturizer to your nails and wearing a cotton glove or socks over your hands or feet overnight while you sleep. Before we end this article, we would like to help you find the answers to the questions boggling your head. In this part of the article, we collected and answered the most frequently asked questions about nail strengtheners and nail care. Try to read these following questions and answers to become more knowledgeable about nail care and other nail care treatment products. Is gel polish bad for nails? Though plenty of nail products can help you get prettier looking hands, some nail products can actually cause nail damage or ugly-looking nail discolorations. One kind of product that plenty of people have asked about is gel polish. Gel polish is this thick nail polish that comes out very clean once applied properly. It looks really great on the nails, but it may come with a health disadvantage. According to research , since gel polish needs to be set with ultraviolet rays, it may cause skin damage, premature aging, or even cancer over time. Not to sound like the bad guys who ruined gel polish, but as research states, it may be detrimental to your overall health. Why are my nails soft and bendy? A lot of things can cause soft and bendy nails. Some things that are known to cause weak nails are genetics, overexposure to wet environments, overuse of nails, applied pressure to nails, diets, and vitamin deficiency. Doing chores without protective gloves. In cleaning scenarios, what usually happens is that the nails get weakened by constant exposure to detergents and cleaners. Using Alcohol sanitizers frequently. Alcohol can dry out your nails. Pressing down on nails in the wrong direction. This is what usually causes nail ridges. By knowing what causes your nails to become soft and bendy, you will be able to avoid them fully or at least partly. What vitamins are good for nail growth? Protein is the main cause for nail growth. If you have weak nails, you can always take in protein vitamins to make your nails grow stronger. The best vitamin for nail growth is B7 or Biotin. This vitamin is very essential for maintaining your body’s protein production that can significantly affect your nail growth . Does nail polish help your nails grow? Not everything we put in our nails can aid in growth. One particular item that has boggled nail care users is nail polish. Ever notice the speed of your nail growth when you have nail polish on? Some people think nail polish makes nails grow slow, others thought the contrary. However, the truth is, nail polish doesn’t even really affect nail growth. What it does instead is offer a protective layer over the nail. Nail polish may not be the best tools for growing nails, but they’re certainly one of the best choices when it comes to stylish nail protection. On the downside, if you have weak nails, nail polish may not work that well for you for it can only further weaken them . We hope you learned a lot from our short reviews and nail care trivia. Feel like you know enough about nail strengtheners and nail care? Try taking this short quiz to find out how much you have learned! Even though all the products included in this roundup work great as a nail strengthener, we can only choose one product as the winner. For this roundup, the clear winner is no other than Onyx Professional’s Hard As Hoof nail strengthener cream. This product is truly the best nail strengthener since it can be used as a nail strengthener and a hand moisturizer at the same time. We highly commend this product’s formula that is rich in vitamins, minerals, and emollients that can ultimately aid in nail health. Furthermore, this product contained the most amount of nail strengthener as compared with the other products in this roundup. It’s also the only product in this roundup that came in the form of a cream, which can be quite convenient since you would just have to apply it as if it were lotion. Well, there you go, a complete buying guide for the best nail strengthener. We hope you enjoyed reading and learning from this article. If you would like to know about more beauty products, just stay around. We have a huge collection of articles that you may find helpful and fun to read. Also, don’t forget to show us your support by sharing this article with your friends. Thank you!